Before I get into the meat of this post, I would like to ask a quick question. I have two (!) Cricuts, but I'm not sure they're really what I want. I think that I'm looking for a die-cutting machine that I use cut with the fonts on my computer and download other shapes and things. Does something like that exist? 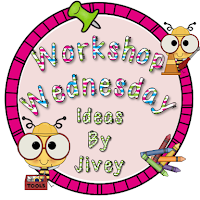 Anyway, on to Jivey's Workshop Wednesday linky, which will actually be a monthly linky of Pinterest ideas for reading and math. Here is my reading pin for this month. We are getting new reading series (Journeys, I think), so I'm not sure what I will be able to incorporate on my own. I know that there will be a lot of Common Core standards to cover with the series. But I thought that this handout would be helpful for parents while I'm figuring out what else I will be able to teach. Since I don't teach math, I'm going to share a social studies pin. I like how Tara combined the vocabulary foldable (which I already do for literacy vocabulary) and some Q and A flaps. This one is definitely doable. We do a lot of foldables in social studies already, so this would be an easy addition. Hello Diane! You may want to look at purchasing a Silhouette Cameo it allows you to cut out fonts and clipart from your computer. I hope this helps. Hey! I'm glad you linked up, but I can't find your SS pin...? Can you see it? Maybe it's my computer? I see them! Hooray! :) great pins too!!! Diane, you want a Silhouette Cameo (or portrait) It is BEYOND amazing. I've used both a cricut and own a cameo. They even have educators pricing! You won't be disappointed, PROMISE! The website is silhouetteamerica.com or you can order from silhouette off amazon. I can't WAIT to hear all about it. Good luck! I have a Silhouette Cameo on my wish list! I've only heard great things about it! I also heard they're pretty easy to learn to use, which is a plus! I can't wait to see which one you get and your creations! I can't help you with your question, but I can give you advice about Journeys! The vocabulary is FABULOUS. I have a freebie in my blog that goes with it, (just look for the vocabulary label) but otherwise I wouldn't reinvent the wheel. The workbook, well, it's a workbook. Meh. Fine for spelling, not impressed with the rest of it. There are too many assessments. My administration has suggested we don't use every part every week. The kids love the stories. That's always important. :) The rest, well, I know from your blog that you're creative enough to make it work! I used a foldable very similar from Laura Candler. My 4th graders needed a little bit of guidance the first couple of times before I tried Tara's foldable.